Floating ice hazards are a risk to safe navigation in both the Arctic and the Southern Ocean as a result of changing ice conditions and increased marine traffic in recent years. These hazards include icebergs and ice islands (a type of iceberg in the Arctic that is tabular in shape and up to several km in length). Under the influence of climate change, calving (break-off) rates of tidewater glaciers, floating glacier tongues and ice shelves, the source of icebergs and ice islands, appear to be increasing, particularly in the Arctic. Understanding the drift and deterioration of these ice features is a key challenge to the ice community and tends to be limited by a paucity of observational data from around Newfoundland and Labrador, where water temperatures are significantly warmer and interaction with sea ice is less common than in Arctic waters. Observations of drifting ice islands that calved from the Petermann Glacier in NW Greenland were attempted in 2011 in the Canadian High Arctic (69-75ºN) to examine draft, surface roughness and basal features using an Autonomous Underwater Vehicle (AUV) to help improve numerical ice hazard drift models. The AUV was successfully deployed under a grounded ice island, yet key challenges for future deployments involve mapping ice that is both drifting and rotating. Acoustic localization, combined with terrain-relative navigation, is proposed to deal with this motion, enabling accurate in situ measurements of the underside and sidewalls of the ice. 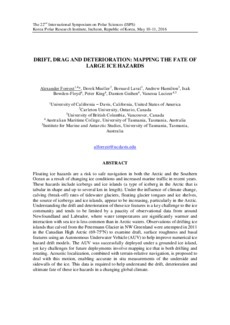 This data is required to help understand the drift, deterioration and ultimate fate of these ice hazards in a changing global climate.